Looking at Kolb’s learning cycle (see p7 of the Reflective Practices Reader) you can see that all the tasks you have been doing and have yet to complete as part of the module are about having a concrete experience. For instance you may have made a 45sec movie clip about what you expect from BAPP, blogged an inquiry task or identified your five most important sources of information. These tasks, at first glance, may appear random and unconnected but towards the end of the module as you approach the assessment task of writing a critical reflection on your professional practice, you will move on to the next stage of Kolb’s cycle and review and reflect on the experience. What impact did these tasks have on your professional practice? What was learned as a result of completing them? Reviewing all the tasks involves sitting back and making mental or actual notes on each of them. In Dewey’s view reflective thought involves “active, persistent and careful consideration” (see p6 of Reflective Practices Reader for full quote). You may see that there are patterns. For instance, certain tasks engaged you with technologies, while others were designed to actively engage you with peers. But the question to ask is what effect have they had on your professional practice? From all the tasks, certain themes may emerge and you need to identify these through another point on Kolb’s cycle – concluding from the experience (task). This process should provide you with the material you need for your critical reflection. Another point on Kolb’s cycle is trying out what you have learned as a result of the reflection and identifying what was actually learned. 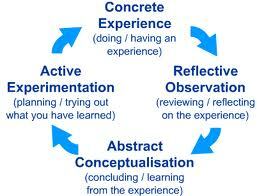 You should be looking for deeper learning in constructing your critical reflection. While you might have learned how to embed a link to a flickr site from your blog, the question to ask is whether this actual activity had any impact on your actual professional practice and if so how? You may find, perhaps, that the process of learning was more about the content of the images of you posted on flickr. You may have noticed through engaging with other blogs that some of your colleagues were more selective in images they provided links to and thus used the opportunity to demonstrate their different skills / aptitudes, while on reflection you posted images which were all slightly different shots of the same event / show. Therefore in constructing a visual CV, on reflection, you may choose to revise what you include on a flickr link in the future. Key issues to cover in your critical reflection on professional practice are to consider how your professional practice has been changed and this will be the subject of my next blog. I held a series of regular jobs in Information Management and as Chair of the Dynamic Green Ink Writers Group established performance spaces at a range of Arts festivals. I worked with a range of professional groups through various University lecturing posts in professional development including librarians, police officers, NHS personnel, teachers. Lately I have achieved my Competent Communicator Award through Toastmasters International.